The news about HMV calling in the administrators is sad but not surprising. Having to compete with supermarkets, downloads and online retailers - often with much cheaper prices and with no awkward moments of judgement when you're buying that classic series Doctor Who DVD - meant it was difficult for the high street chain to keep up. 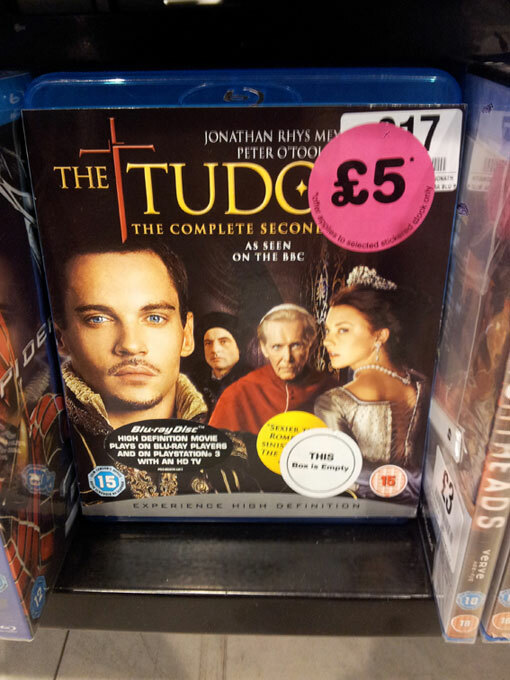 But, do you know, maybe if I'd bought this bluray copy of tv-ooh favourite and raunchy historical romp The Tudors (series two!) I saw last week for only £5, then maybe we wouldn't be in this sorry mess now. It's unlikely of course - that's not how economics works, and I doubt an extra £5 in the tills would have helped that much, although I would have enjoyed hearing actors begin and end sentences with 'Yes your Majesty' again. 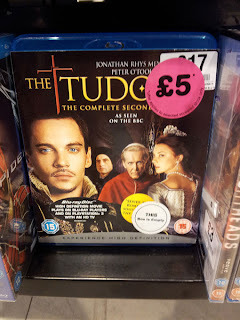 But this complacency at having spotted a genuine, actual, attractively-priced bargain for the first time in a long time in HMV was matched only by my surprise - hence taking the photo. I didn't buy it though - I thought, I wonder if I can get that cheaper online (I've just looked - you can't). But this is the attitude they're having to contend with. Then, next time I was passing, I went back to HMV to buy it, later that same week. It had gone. And the lesson? Buy a bargain when you see one, because - never mind the item - the entire shop might not be there next week? Yeah, something like that. I hope HMV can sort out its troubles - not least for all the staff with jobs at stake - and find a way to run a viable high street business, where you want to buy as well as browse. The high street wouldn't be the same without it.